Margaret Rizza is one of the most admired composers of church music of recent times. This profoundly gifted lady demonstrates her diverse talents with her two latest releases. 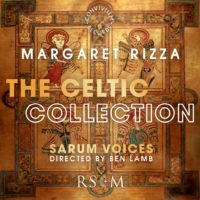 ‘The Celtic Collection’ has 18 Celtic and Gaelic prayers beautifully set to music by Margaret, sung by Sarum Voices and conducted by Ben Lamb, while ‘Officium Divinum’, is a musical journey through the daily cycle of prayer Margaret sang professionally for 25 years under the name Margaret Lensky at concert and operatic venues performing with such conductors as Benjamin Britten, Igor Stravinsky and Leonard Bernstein yet in more recent times has seen in 2006 her original arrangements of Taize chants reach number one in the Classic FM charts. From 1977 to 1994 Margaret taught singing at London’s Guildhall School Of Music and Drama. During the first years at Guildhall she worked on many Christian outreach projects taking groups of students to share their music in prisons, hospitals, hospices, schools for the blind and working with people with physical and learning difficulties. She has also trained and conducted the senior choirs at Sevenoaks School, Walthamstow Hall School and Combe Bank School. Margaret founded and directed many groups and ensembles including The London Camerata, The Cameo Opera Group, St Thomas’s Music Group and the Gaudete Ensemble, the latter two making many recordings. Today Margaret runs choral workshops at events and retreats and runs days of prayer, music and meditation. This icon of Christian choral music spoke at length to Cross Rhythms. Tony: When people ask what kind of music you do, how do you describe it? Margaret: That’s a very good question that I can’t answer. It’s difficult because it falls between two schools. I had a whole day yesterday with Tim Ruffer, the director of RSCM Publishing. He came over and we had a good chat about this. I was discussing with him the description. I would say that it’s classical and not pop, so we can establish that; but there are many classical ways of writing music. Mine doesn’t fall into the typical category of cathedral music. It’s most probably very simple, much more music of prayer. I have written other styles much more classical contemporary, not suitable for small choirs who don’t have much ability in how they put together singing for a service because they don’t have the facilities. Simple tunes make up a lot of my music, and they can be used and prayed through by small choirs. It’s difficult today to get people to come and sing for a service. It’s much easier on the pop side, I imagine. Tony: The protestant tradition is evolving. At present services tend to revolve around a worship leader. Margaret: I think that is a wonderful way of doing it, because you are inviting the people worshipping to use their voices – not just sitting listening but activating what is on the screen. Voices are so intrinsic to us – rhythm within us, really the pulse of God within us. We are participating in that rather than simply listening, although that is very important. A lot of my music, and I feel very humbly grateful for this, is used in palliative care. People who can’t get to churches listen, praying through music as they sit there. The retreat movement uses a lot of it. People go on retreat to try and understand where God is leading them. They’ve got time to eradicate the thought process, cleansing themselves. The music used there is not complicated music. The classical contemporary music I have done is used as concert music for professional choirs. Tony: In cathedrals it seems congregations are joining in with the music not with their voices but with their hearts. Margaret: Absolutely. Also, there is this extraordinary thing that a lot of people are shy to use their voices. I have been very, very moved by people trying to get through hymns with very little aptitude for singing. It’s amazing how moving they are in the way they are trying to express through their voices, through participation; they’re not used to being led in the way that you would lead them, with a giant screen and somebody masterminding it all. I think that’s wonderful. Tony: Is the resistance to singing out inbred in British culture? In Africa, you can’t stop people singing. Margaret: There’s something very natural about it. People tilling the earth with oxen would be singing. I have a Filipino who comes to help me clean the house, and he hums and sings a little bit when he’s vacuuming. I think that’s so beautiful; it should be a part of the way we express ourselves. If we can do this, it’s very important for the well-being, for the healing of us. I’m part of two or three churches because I hate being pigeonholed, and I go to a church that is very evangelical. My daughter and son-in-law and three grandchildren go; it’s very important to be where they are, in the worship part of their lives. The worship songs are very easy to get hold of; not what I would be writing – not because I don’t like it, but I can’t write in that way. There, people with the big screen, are all singing. Tony: You’ve encouraged people to worship God in silence. As much as we want to be making a noise as we worship, there are aspects of the Godhead best met in silence. Margaret: I truly believe that. I think we’re in an extremely difficult culture today because it’s very much on the technology, it’s all activated by the brain. It’s extremely difficult to put time aside. I believe there is a fundamental part of us which can, through silence, break through the barrier of the mind. Once you break through, there is an incredible spaciousness, or depth of silence, which is to do with the eternity deep within us. I don’t think eternity is out there, or once we’ve died we come into eternity; I think eternity is deep within us and it’s part of our growth. It can be enriched and built upon and clarified by silence, because silence can break through the build-up of the thoughts which accumulate and can be very divisive. We can be very addicted to thoughts and can’t let go of them, and it’s the tangle of thoughts we get into and don’t even realise, so we hang onto them. I find it very difficult: I need to let go of them but how do I let go of them? Letting go of that and coming into the depth of consciousness deep within us from the very beginning – it’s primordial. When we give up our temporal life, our humanity, that has to go; once that has gone, I feel there is the most wonderful, incredibly powerful sense – I’m reluctant to hang names onto it, but I believe that through the silence and breaking through the barrier of the mind we come into a spaciousness which is to do with oneness, unity with everything around us. Tony: I grasp a lot of what you’re saying. It is an elusive thing to try to articulate. When I read some mystics, I understand their use of metaphor is to help me; I get enough to want to experience that dimension of tranquillity. Margaret: I don’t get it: it’s something one is conscious of in a very unknowing way. It’s to do with the intuitive, the perception within us which can so often be buried. We’ve forgotten, because we’re so brain-orientated, how to be in touch with it. There are fleeting moments when you might see something. I’m looking through the window at the moment and the sun is setting. It’s very, very beautiful. You could enter into that sunset and be amazed by it; and in the amazement, we’re touched by the sacredness of where we are living. That is what I think we can lose the sense of. Also, it’s in the consciousness of where we are, the work that you do. I’m sure you find this in your connection with people. Tony: I appreciate natural beauty, but I am an urban animal. Stoke-on-Trent has been in political turmoil recently, as are a lot of places in the world. Our world seems to be careering out of control. Margaret: I couldn’t agree more – it’s hurling itself to the edge. Once it does that, can we come back? We most probably can’t come back; but things can change, and this is what is so wonderful. Tony: The privilege you and I enjoy – me as a journalist, you through your music – is to be able to share with others about the riches we’ve found in Christ. Do you find that wears you out? Margaret: Not really. In a way, we put the cart before the horse at the beginning of this conversation. We spoke about getting into the depths, getting outside the mind, but it’s all to do with understanding the teaching of Jesus. The Gospel of John is my favourite because it’s the most mystical one – I’m crazy about the mystical aspect of it – but it’s deeply ingrained, as you are saying, with the people, the poor people in Stoke-on-Trent. I’m in a very rich part of the country in Sevenoaks with very well-heeled people, but there is this huge importance in the gifts we’ve been given of Jesus, knowing Jesus who offers us life in its fullness. It’s very difficult to help people to understand this when they are trying to survive each day with the brokenness they are involved in and the difficulty with health problems, separations. I can’t start talking about the Bible or “Jesus is the way”; but it gives me a huge amount of humility to know this when I’m with people. But you – with the work you do, your journalism – and I try with my music to reach out through Jesus, who is in my music, to people who are very disadvantaged or who are going through great difficulties. It’s how we live, how I can possibly live my Christianity, in the world. I have an evangelical group at my home every other Tuesday, and we were talking about this – the impotence that we feel. We’re very gifted, very privileged, but how can we get through; the gift of Christ within each one of us, how can we best illustrate it? Really, I suppose, it’s being where we are and blooming where we’re planted, in our tiny, tiny little God-given ways. There are numerous miracles, I find, each day, are overlooked, and not even realised; and yet they are miracles: there’s beauty in the simplicity of that. Once you see it in that light, it’s a shift in consciousness; you see it in the light of Christ. Tony: Are there one or two of your songs you feel go some way towards that aim? Margaret: Certainly there are. There’s one I wrote some time ago, “Creator God”. “In the darkness of the still night/In the dawning of the daylight/In the mystery of creation/Creator God, you are there.” It highlights everything that I believe. Tony: We’ve got so many people in the western world who believe that life is just an accidental collision of atoms. I try to pin these things in our hearts, in our thinking, because it’s not about this awful business of separation – God out there, the duality – it’s God deep within us, within all these things we are aware of that we’re mixed up in. “In the yearning of our heartbeat/Creator God, you are there/In the love for one another/In the sharing of our being/In receiving and giving/Creator God, you are there.” The last verse: “In our joys, our hopes, our healing/In the wakening to revealing/In your call and our responding/Creator God, you are there. In our prayer and in our service/In our praise and in our worship/In your love that is eternal/Creator God, you are there.” Really that’s where I am in the music. Cross Rhythms was started by Chris and Kerry Cole over 30 years ago. They saw that a media voice for the Christian faith was vital to get the Christian response to society’s ills back into the marketplace of everyday lives. Through all these mediums, Cross Rhythms is typified by using contemporary Christian music that can culturally engage with people who are outside the churches in today’s society. Cross Rhythms has also looked to communicate the Christian faith in a language that is accessible to contemporary culture but doesn’t water down it’s truths.